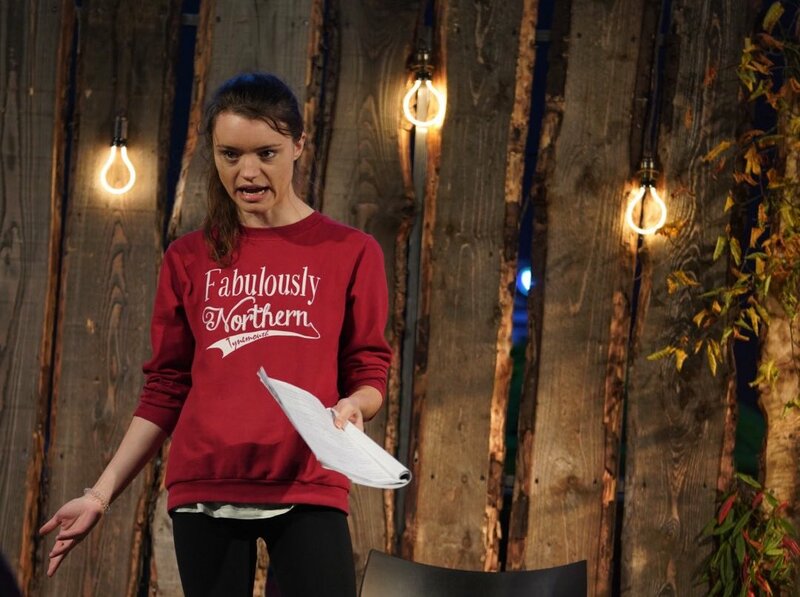 A cloudy Sunday afternoon was lit up by the electrifying performance of Tamsin Daisy Rees’s Teddy, a short monologue which explores teenage struggles with self-expression, anxiety and one’s exterior image. Following Jackie Edwards’s performance as the titular character, Tamsin was joined in a panel discussion by Caroline Dower, Dr Dave Thompson and Veronica Harnett – all specialists in mental health issues affecting young people. The entire event was crowd-immersive, thought-provoking and highly entertaining. ‘It suits me, being mad,’ says Teddy halfway through the monologue. She is a character who boasts an artful swagger and benign restlessness as she helps Roger out with his allotment. The helping-out subsides into soliloquising chit-chat, sifting through her thoughts in an oscillation between passionate outbursts against the social expectations that society demands of her, and moments of demure reflection on her complicated relationship with Roger. Perhaps the most striking scene occurs when Teddy exclaims, ‘I just started crying!’ amid torrid laughter – a characteristic juxtaposition that is evident throughout Tamsin’s work. Directorial touches by Anna Ryder are nuanced and well played-out, such as the balancing of a stick on Teddy’s head, which symbolises the balanced mental state she is trying to reach. Writer, director and actor were synchronised in a dance of words, action and humour which worked towards a greater literary purpose: opening up the discussion of mind, body and mental health. The panel which followed was both reflective on Tamsin’s piece and extrapolative towards finding possible solutions that could help those in youth aid and teaching sectors. Veronica Harnett called for greater focus on creativity in schools, citing a line she heard from a young person: ‘I don’t want you to fix me. I want to be outrageous. I want to be debonair.’ The importance of the arts in releasing these emotions becomes evident in the character of Teddy, who wrestles with the true definition of being ‘normal’. Her expressive monologue is perhaps one artistic form of release which can be made available to teenagers through drama and creative writing in our schools. Teddy – being a by-product of Tamsin’s work with pupils from her former school – is proof of this. All those in the room left with a responsibility for engaging in conversation en mental health issues, and the performance of Teddy presented a novel way of combining truthful storytelling with an undeniable social purpose.